Home > Poly Fence Rolls > Poly Fence Roll Comparison - What do I need? This page will help you select and compare the different strength poly fence rolls for your project. All of our poly fence rolls are rounded strand type. 1) It has a higher breaking strength per square foot - Without question, if you take two pieces of the same weight polypropylene material the rounded strand or semi round will have a higher breaking strength per tensile strand and also per square foot. 2) It's less visible - We specialize in fence systems to keep animals in or out. Most customers use this type of fencing to keep deer out in particular. To have an effective deer fence or a fence that will blend in well with your landscape, you need the least visible most effective material. The beauty of this type of material is it will disappear from a short distance away (as little as 15 feet away). This is especially important for those customers trying to preserve a nice view from their back yard or don't like the look of a tall barrier fence. This material is truly invisible from a few feet away. Flat strand fencing is much more visible by comparison, especially in the higher breaking strengths. 3) It lasts longer in sunlight and wind - The enemy of any poly fence product is direct sunlight and wind. As time takes a toll on your fence, sunlight will break down the material and turn the black glossy material more of a matte color then finally turn it grey. It will become brittle then finally break when something hits it. Rounded strand fencing by design doesn't have any flat thin edges and has tensile strength in a complete circle. This enables our Critterfence Poly Mesh to last longer outdoors than comparable flat strand mesh. 4) It stretches less - Rounded strand poly fence material has flexibility, but does not stretch as much as flat strand fencing. If a poly fence material has too much flexibility it looses structure then needs to be supported. An extreme example would be a soccer net type material that doesn't stand up on it's own. Comparable rounded strand fencing has more structure than flat strand fence material. 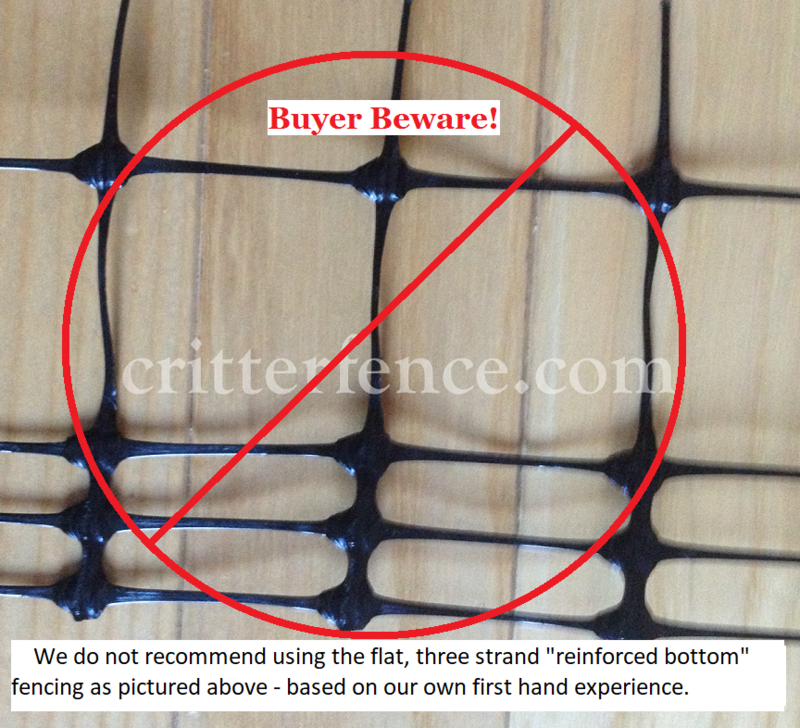 Our Critterfence Brand fence material has some structure and stands up on it's own when you unroll it. If you need fence material as a barrier around a garden, as a backyard fence (house to back yard back to house again), or a complete perimeter including driveway) we only recommend rounded strand poly fencing or semi-round poly fencing. Economical & the least strong fencing we recommend for animals. Stronger than poly fencing found in big box stores or mass marketed online. If you can break it with your hands, it's not suitable for animal fencing! Suggested for commercial or agricultural grade applications greater than 500 linear feet. Also used for deer containment or anytime the best available product is needed. Requires closer post spacing than the 700 or 800 poly.